Greeting friends! Hope you had a lovely week. We enjoyed some warmer weather and some time outdoors...woo hoo! Our world is beginning to bud. It's glorious...until all that pollen showers us in allergies, that is. For now, I'm reveling in it. Quick question this week is...What type of blog posts do you read (or seek out) most often? Mom/parenting posts, recipes, giveways, freebies/frugal finds, blogging advice, etc? Thanks for stopping by and playing along. 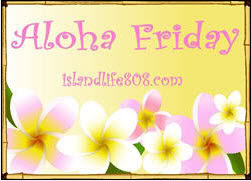 Visit An Island Life for more Aloha Friday Fun. Don't forget to enter my DENTASTIX giveaway while you're here. I'm giving away 5 Puppy Prize Packs for your four-legged friends! Happy Friday to you all ! We have had wonderful weather here as well though we are ready and stocked with allergy meds, waiting for it to all hit. Thank you for stopping by and leaving me your comments. I will shoot you an email (BTW, yes, that is me from FB :) ) this weekend as weekends seem to be the time I have a moment or two to gather my thoughts. Ha! To answer your question, most often I think I look for mom/parenting blogs. Hope you are feeling well. LOVE your blog! Hope your Friday is the best and brightest day of your week so far! I like the day in a life type posts - nothing that can really be categorized, but a little glimpse of daily life with humor thrown in. I read a variety. I have my favorite stops. Yours, being one. I start with visiting meme participants and then I move on to my regulars. I love reading tutorials lately. I like a nice mix of everything all wrapped up into a parenting/mom blog. Always fun to hear stories about family life, fun craft projects, items you use, recipes you like and try and more. I like personal posts and getting a peek into my blogging friends' lives.